Whilst I believe the UK is one of the best places to enjoy sports in pubs and bars, a recent research trip allowed us the opportunity to understand how it’s done stateside. Now many would say the Americans invented the sports bar concept so it was great to see what the mighty city of New York had to offer. A place with legendary teams like the Knicks, Yankees, Rangers, Jets, Giants and the boxing mecca that is Madison Square Garden. Now the set up across all the venues we saw were similar with seating a priority. And this we believe is in part because of cultural differences with US sports (apart from the MLS) as they are dominated by tactical breaks filled with adverts. These increased breaks means the games are longer, so you want to sit down and for that length of time your going to get hungry (I’m talking 2 courses versus a pie or burger). Table service is key, anyone who has been to the US will know the standard level of customer service funded by a tipping culture. The customer occasion seems to fall into friends being together, enjoying a game or a rerun of a recent previous one. 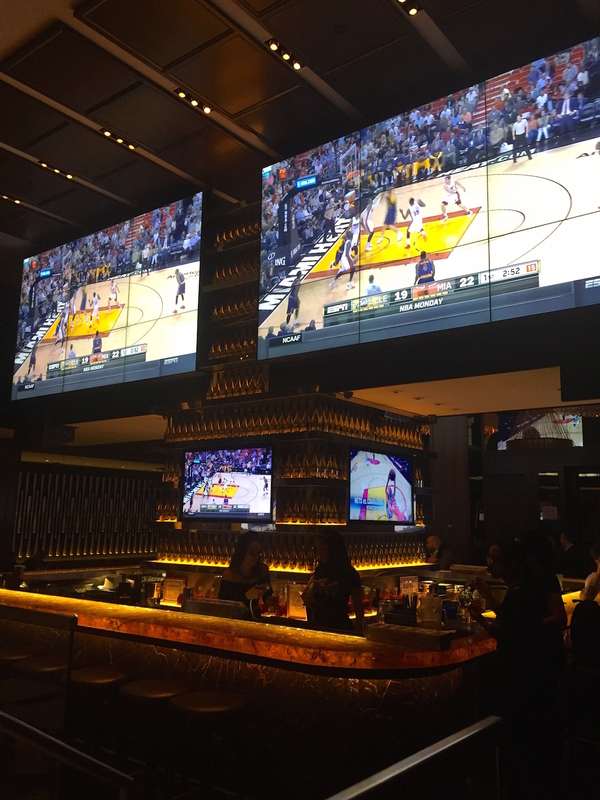 All venues have lots of screens with TV’s behind the bar showing multiple sports, not something in general you see in the UK as these are often kept for selling opportunities. 1. When they show sport they show numerous sports at the same time, it’s all about choice with something for everyone. 2. The picture quality was brilliant everywhere we went, and not one big screen and projector was seen. Much more use of video walls, popular in retail and bound to be used more in hospitality. 3. Even venues that are not sports bars (diners or restaurants) have TV’s so are able to show the big sporting occasions that capture the nations interests. 4. Food is a huge part of the game. 5. Venues are less packed allowing table service to work really well. Whilst some of the observations can be put down as cultural a couple of areas should definitely be observed. A. You don’t need to pack your venue out but look to get a higher spend per head out of your customer. Same income but much greater customer experience. B. To encourage people out of their home to watch sport you need to offer a great atmosphere that can’t be replicated at home, however it can’t be at the expense of picture or sound quality. Get the two together and you have a winning combination.